Kitchen is one of the most important place of any home where delicious food is cooked. So being the most important place of each and every home we all should give kitchen its due importance. Now days we see a lot of options to beautify your kitchen that range from decorative wall colors, wall tiles, floor tiles, opting for a modular kitchen etc. 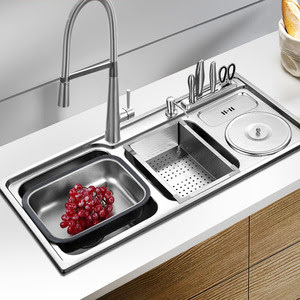 but many a times we fail to realize that we also need to think about and transform the look of ‘Kitchen Sink” which is one of the most important thing belonging to the kitchen. 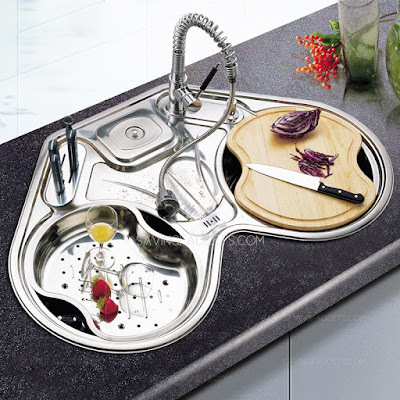 Thus we can say that the beauty of kitchen can be enhanced with using beautiful and attractive Kitchen Sinks. With just a momentary thought of going for ‘Designer’ and ‘In Trend’ kitchen sink may make us feel that opting for it may be an extravagant thing which may lead to wastage of our hard earned money but guys trust me, putting money in a ‘kitchen sink’ is always a rewarding investment which will make you feel rejuvenated when you enter in your kitchen. It will make working in the kitchen appealing etc.